BrandSaver.ca is an amazing coupon resource. Every few months BrandSaver has 60+ new coupons for many P&G products. Ranging from household to body and beauty. They also use a similar platform that webSaver.ca uses. This is great as it leads to those hidden coupon portals. BrandSaver.ca usually has many hidden coupon portals but… These portals tend to yield coupons already available on their main coupon portal page. This however does not count out all the hidden coupon portals BrandSaver.ca has. 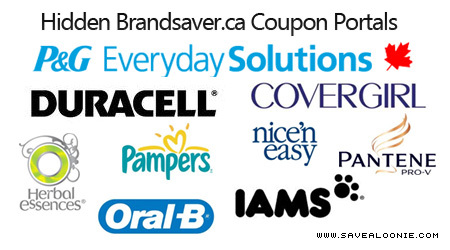 So we have put together a list of all the BrandSaver.ca coupon portals that we are aware of. Maybe you might be able to score a few extra coupons!